It is with utmost pains that I pen down these concerns pertaining the atrocious treatments being steadily meted out to Biafrans from ages, by the agents of the Nigerian state all in the name of politics both within and outside Biafraland. There has been concerted efforts by the political class to rip us off of our dignity as a people. Biafrans have persistently suffered various degrees of inhuman degradations ranging from full blast victimization, subjugation, incarceration, deception, to rapes and death. The Northern Hausa-Fulani puppets of the Biafran extraction have given themselves over as willing vessels in the hands of these cabals all, in the name of politics of selfish interests to impoverish their people. They have shamelessly resolved to mortgage the future of even the unborn generations in the service of their slave masters. It therefore becomes foolishness for anyone to be part of the prevailing Nigerian engineered insanity in the fruitless bid of repeatedly doing something over and over again same way with the hope of achieving desired results. We should not yield ourselves to blackmail, vain promises and bribes of peanuts, just to continue getting involved in Nigeria's insane elections especially in the entire Biafraland. The sacrifices of our fathers, mothers, brothers and sisters who laid down their lives that we may have our freedom, must not be traded for frivolities. The Nigerian murderous security operatives have killed and secretly buried our young men without any traces. 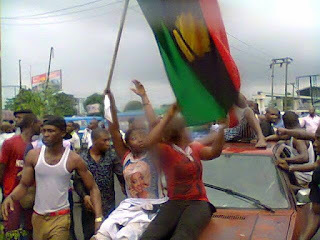 We should not forget the 25 young and promising Biafran men between the ages of 25 and 40 years that were gruesomely murdered, whose bodies were dumped into the Ezu River in Amansea, Awka North Local Government Area of Anambra state on the 19th of January, 2013. Ezu River is neither Sambisa forest nor Bermuda triangle that kills and takes out of site, it's victims. Since 19th January 2013, there have been hundreds of unanswered questions staring the authorities in the face. It is yet fresh in our memories, remembering how the Amansea people woke up from sleep that fateful morning to discover quite a number of floating bodies in their river which happens to be their only source of drinking water. It is pertinent to recall here that even the Nigerian Senate had constituted a committee with the mandate of investigating the circumstances leading to such a bizarre development. This followed a motion moved by Senator Andy Ubah representing Anambra South. That Senate committee comprised of Senators Paulinus Nwagu - chairman, Senate Committee on Police Affairs, Mohammed Magoro - chairman, Senate Committee on National Security and Intelligence, Solomon Ewuga, Mohammed Sani Sani, Dr. Chris Ngige and Alhaji Shaaba Lafiagi who visited the traditional ruler of Amansea community, Igwe Okonkwo in his palace and the initial burial site of the deceased at the bank of Ezu River. This took place before the commencement of public enquiry at the Anambra state Government House, Awka but due to the corrupt and oppressive political antecedents inherent in Nigeria politics, no report of such enquiry has been allowed to see the light of the day. Can we yet remember how the then Anambra state Police Commissioner - Mr. Nassarawa curiously told the Nigerian Senate Committee handling the investigation, about the mysterious discoveries of the decomposing bodies which were buried immediately following a court order? It is only in Nigeria that a sudden burial of such a disgusting act could be effected without credible investigations and autopsy. The ugly event of 30th of May 2015, that left more than 150 Biafrans massacred by the security agents of Nigeria during a very peaceful remembrance to mark Biafrans Heroes and Heroines Day, is yet another reminder. The chief security officer of Anambra state - Willie Obiano, under whose nose this act was perpetrated, shamelessly and brazenly told the world that nobody was killed. This same Obiano subsequently came begging for forgiveness of the dastardly act against his own people when the truth could no longer be trifled with. The Ozubulu massacre that happened a number of months ago seems to have so suddenly be forgotten. Up till date, nobody has been held accountable for that attack that left more than 35 Biafrans dead during a church service at St. Philip's Catholic Church, Ozubulu in Anambra state on the 18th of July 2017. Can you still remember how the immoral Governor of the state, Willie Obiano and his vampiric fellows in the Anambra Police Command without investigations, conclusively announced to the public that the killings were triggered off by a feud between two drug lords doing business in South Africa? But again when one of the concerned came back and bared his mind, the whole naked lies of these murderous agents of the Nigerian government, became exposed. All these killings took place only in Anambra state. 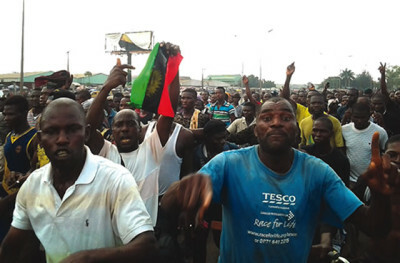 It becomes indisputably necessary therefore to categorically state here that no Biafran in his or her right senses will find any reason to move out of his or her house to cast vote for any of these men in politics, presently jostling for positions to service their egocentric Interests and that of their slavemasters. Just as usual, they don't have the interests of the people as their driving force. What will be your joy therefore while standing out there at the risk of your life, going out to cast your ballot? There is absolutely no infrastructural development in Anambra state that will impact the life of the ordinary person in the state. No good roads, no portable drinking water, no good and affordable healthcare services and electricity etc. What then is the motivation behind going out to vote in the elections? These people in connivance with their Hausa-Fulani demigods have consistently been killing us. A wise erudite scholar - Jacques Fresco once said, and I quote: "Politicians are not elected to keep things the same". Keeping things the same entails a furtherance of the corporate state, which makes life especially in Biafraland despicably unbearable for us. Since it is obvious that we cannot work within the established system to effect the required change, clinically boycotting the forthcoming elections fixed for Saturday the 18th of November 2017, becomes the most ideal, effective and legitimate form of dissent to employ. The very definition of insanity in this context, is doing the same thing over and over again and still expecting fruitful results. Biafrans are not insane by every definition of it. We have had enough of their stories and deceits. It is now time for us to change the rhythm if really we are taking charge of our tomorrow. A WORD IS A ENOUGH FOR THE WISE! BOYCOTT THE ANAMBRA STATE GUBERNATORIAL ELECTION!! SAVE YOURSELF FROM DEATH BY STAYING INDOORS!! !